We threw together this little 1.5 minute look at Paudash Lake. If you're from the area or cottage here, you can share this with people who ask, "Where's Bancroft?" Paudash Lake, Bancroft, Ontario, Canada. YouTube link here. We wanted to remind you that Bancroft Town Council decided in 2015 to move the Bancroft Farmers Market to Millennium Park! The Market will be open on Fridays from 11am to 4pm starting June 17, 2016. The vendors are amazing and you can find out more about what's happening in local growing over at Harvest Hastings or visit the Market's Facebook page. There are lots of great local people setting up a stall at the Bancroft Farmers Market each year. These folks might be your neighbours, your friends, your family members, your co-workers. They are people who live in our community, or nearby in other North Hastings communities. They’d love to get to know you in person down at the market, but until you can visit them face to face, you can get to know them a little bit here. We love supporting our local community, so we didn’t want to cut this short! In this week’s post, we introduce you to Living Water Meadows, Maple Leaf Chocolate Co, and Hillsview Farm and Studios. Remember that vendors vary week by week so we can't guarantee these goods are always available. First up is Living Water Meadows. They are located on Hybla Road in Bancroft. They grow a variety of crops such as strawberries, garlic, tomatoes, and blueberries, and also sell their own eggs and some baked goods. For farm updates including news on what they’re bringing to the market throughout the season, check the Living Water Meadows Facebook page. Guess what Maple Leaf Chocolate Co. makes? It’s more than just chocolate. It’s handmade, fair trade, organic chocolate! They use ingredients from small farms and local businesses, like organic cream from Limestone Creamery in Sydenham and organic fair trade coffee beans from Madawaska Coffee Co. in Barry’s Bay. Their truffles are almost too pretty to eat, but you’ll definitely want to eat them! Hillsview Farm and Studios is located on Hillsview Rd in Maynooth. They specialize in infused vinegars flavoured with organically grown herbs and berries, artisan jams and jellies, again made with organic herbs and berries, and in hand crafted items. They have their own root cellar on the property, which is where the vinegar lives while it is soaking up all the yummy flavours. Find out more about Hillsview Farm and Studios on HarvestHastings.ca or on their Facebook page. Have you ever been berry picking? It’s a rite of passage for summer, so if you have never done it, do it now! You can pick your own raspberries, strawberries, currents, and gooseberries at Switzers Farm. You’ll find them at 655 Clear Lake Road in Bancroft. They sell vegetables such as potatoes, carrots, cucumbers, corn, cabbage, pumpkins, squash, onions and more at their farm gate as well as at the market, and raise beef cattle on their farm. You can also pick up fresh eggs from the farm year round. There’s a lot going on around here! If you’re interested in visiting the u-pick crops or their farm gate, you can find their contact information at HarvestHastings.ca. The last local vendor we’ll be virtually visiting is Granite Forest Farm in L’Amable. They seem to produce a little of everything here. They grow organic vegetables, and lots of different organic fruits and berries. Their organic gardens also produce a growing list of herbs which are used for culinary, medicinal, and aromatherapy purposes. They are expanding into the production of essential oils made from not only their herbs but also from plants and trees found in the wild around the farm. They raise their own poultry including several varieties of chickens and sell free range eggs. They even mix their own certified organic feed for their own use and for sale! We’ve run out of room to list everything in detail here, but you can find more information about their products on HarvestHastings.ca and get farm updates from the Granite Forest Farm Facebook page. Although we spent two posts focussing on local vendors, this isn’t even close to being a complete listing of everyone you’ll find at the Bancroft Farmers Market. If you drop by, you’re sure to discover plenty more that we haven’t talked about here. We’d love to hear about any of your favourites whether we talked about them already or not. Share with us in the comments; we’re always looking for fresh new local produce and products to support! This video is from an American organization called Nourish but the message applies no matter where you live. See you at the market in 2016! The Welcome to the Country blog series is a seven part review of some really essential ideas about rural real estate in Canada. Wayne and I are have been in business in rural Ontario since 1989 and we have sold thousands of country properties to people from urban areas all around the world. The challenges of the transition are real but, in our experience, are so worth the effort. Brilliant landscapes enmeshed in a natural world. The northern lights are visible in October from most properties because our skies are relatively pollution-free. Our lakes have excellent fishing and, just last week, I met a fisherman from Virginia at the Eagle’s Nest Restaurant who said he has been coming to Bancroft to fish for 40 years. A truly low cost of living. We aren't far enough north to run into food access problems but far enough that we aren’t part of Toronto’s urban sprawl. Property prices are a far cry from even those in more Southern areas like Peterborough and Barrie. And coffee is just a little over a buck. A sense of community. We have been so fortunate to have people move to Bancroft from all over the world. They bring with them their talents and their time for community initiatives, like the Art Gallery and the Summer Theatre. As a born-and-raised Bancroft person, I see the ways in which our town benefits from a mix of old and new. 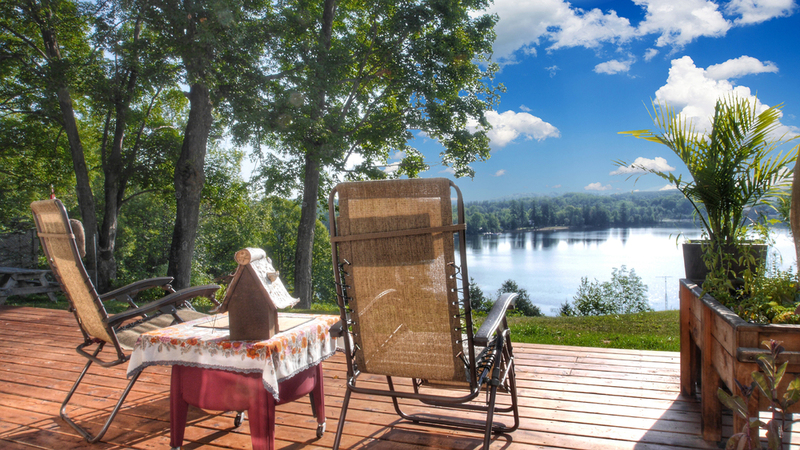 A client who moved to Bancroft with his wife while in their early 60s remarked, “Everyone here cares about who you are, not your career or what you’ve accomplished. It’s very refreshing.” One of my favourite new places in town is “This is a Place for the Arts.” It is a shared workspace and gallery. The selection of paintings, photography and sculptures is clean, bright and so alive with the spirit of rural Canada. We are so blessed to have them, and I would like to publicly thank the group of artists who founded the centre. Access to the essentials. We live in one of Canada’s wealthiest provinces. Like any large country with rural populations, ensuring that every person has fair access to health care, government programs, education, environmental protections and legal representation is difficult. I am so proud of what our town has accomplished in maintaining access to these resources despite a changing, and aging, demographic. Our population quintuples in the summer and our tiny town meets the demands every year. Rural Canadians are used to these mighty efforts and newcomers will soon find that they also get along quite well. Our market research indicates that there are six groups of people moving to rural Canada. New Canadians: People coming from India, Pakistan and China, in particular, are increasingly settling in the country. The properties are affordable and there are real business opportunities, especially in franchising. This is a really important source of diversity which absolutely enriches the fabric of our town. My experience with clients who are new to Canada have always been positive. I feel myself beaming with pride whenever I get to show off our country. Retirees: With longer life expectancies, retirement savings must be stretched. There is little better way to do this than to reduce the carrying costs of a mortgage. With our excellent hospital, our well-ploughed roads and our abundance of one-storey homes, this is a place where aging well is a real option. two of my special clients, john and carol kirby. john and carol have given back so much of their time and attention to bancroft since moving here 12 years ago. Minimalists and Live-Off-The-Landers: People keen to live differently. They make sustainable houses or micro-houses. They adopt systems to minimize waste and don’t collect objects because they’ve got nowhere to keep them. They can grow and create and that's what life is about for this community. Also, their cost of living is so low that sometimes they don’t need to work in a traditional job. They can grow their own sustenance and bring with them a great respect for our shared world. Remote Workers: My brother-in-law, Paul, was one of the earliest remote workers in the area. Paul works for a technology firm in the GTA but has a completely decked out office that allows him to be a valuable asset to his team with a view of the lake. It has worked out really well for Paul and his family and, increasingly, people are finding that their work can be done from anywhere even if they’re not consultants or independent contractors. Essential Industry Workers: People in nursing, medicine, engineering, law and paramedicine. The situation for teachers is more complex, as it is everywhere in Ontario, so there are less opportunities in education in our region. Positions do still exist in the far north and will also evolve as the tail end of the baby boomers retire. The job market for these essential professions in rural areas is relatively stable so a reliable income in a beautiful area attracts a lot of mid-career professionals. Retournees: This group consists of people who were raised in Bancroft but left to go to school, travel or seek employment elsewhere. They’ve gone off to see what's out there. They realize that their dollar goes quite far in the rural housing market and they miss the fresh air, being able to see the stars, park without paying and empty roads. I was one of these people and, now, so is my daughter. These groups represent the future of growth in our community and we are so excited to be making the kinds of improvements needed to attract new residents. Do you see yourself in one of these groups? Leave a comment below because I would love to know why you selected Bancroft and how you came to a rural life. We sat down with Linda Sarginson, new owner with her husband Dave Sarginson, of the Eagles Nest Restaurant in Bancroft. Linda and Dave were married 37 years ago in Bancroft. Linda loves small towns and cottage country life and particularly loves Bancroft's family-oriented style. The newest business venture is exciting and represents a new learning curve for the couple. 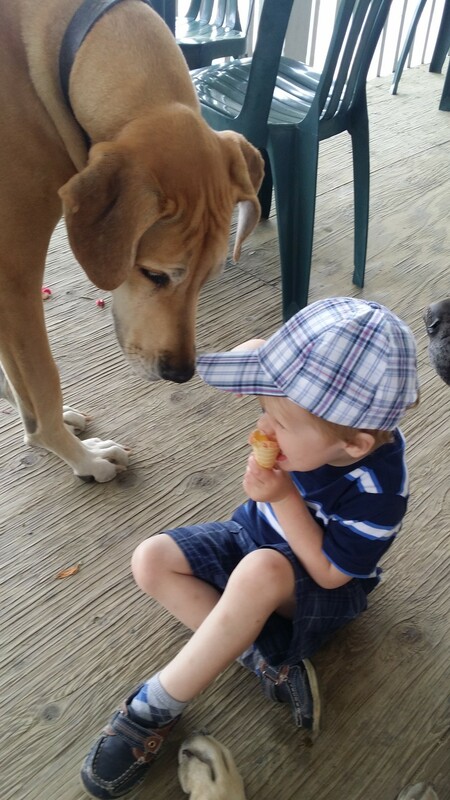 They've always been interested in food and curious about different dining experiences. Linda and Dave knew they were interested in opening a restaurant and casually explored their options for a few years. Their daughter, Brandie, and their son-in-law, Derek Creighton - a chef with over 20 years experience - were among their greatest resources. Derek's parents, Gord and Saidie, are the former owner of the Eagles Nest Restaurant so when they heard that Linda and Dave were keen to open up a restaurant Saidie recommended that they buy her business. After all, Sadie and Gord ran the classic country restaurant for over 27 years, maintaining a committed clientele throughout. Linda and Dave asked Brandie and Derek to work at the new eatery and the dream was born. The confidence that Linda and Dave have in their children is heart-warming. Brandie and Derek get so much joy from planning their menu and envisioning the future of the Eagles Nest Restaurant. Four is certainly not too many chefs in the kitchen. Brandie, Dave, Linda and derek. We can assure you that the food is benefiting - our lunch was so good! My daughter and I shared a chicken soup, some onion rings and a chicken quesedilla. The onion rings are totally unique and have a great kick at the end. The quesadilla has beautifully roasted chicken with fresh grilled peppers and onions. It's all real food, home-made with love. A recent TripAdvisor reviewer writes, "Super Friendly! Nice Atmosphere! Large Portions! Reasonable Prices! Been going to Bancroft for over 60 years and never stopped here. Sure glad I finally tried it. New owners. Completely renovated. Family friendly!" The new Eagles Nest Restaurant opened in May at 183 Hastings Street North. They are open Tuesday through Saturday from 7am to 8pm. Every quarter, they have a Chinese Buffet with dessert. Derek has a real knack for Chinese food and this is a really popular night. The next one is likely to be in September. The signature dish is The Bancroftonian Burger: A double burger with fries and onion rings that must be eaten in under 20 minutes to land your face on their wall of fame. Linda says that it's drawn quite a loyal following. Sorry everyone, if you eat it in under 20 minutes, the meal is not free. The restaurant has been attractive to out-of-town visitors. One of the diners was a fisherman from Virginia awaiting the repair of his boat. He has been coming to Bancroft for 40 years and this was his first stop at the restaurant. He thoroughly enjoyed his salad with salmon. Thanks so much to Linda for taking time to tell us about their new endeavour. We won't be strangers to this place. Please like the restaurant on Facebook! Tyleen & Rod with hunter and toby. When Tyleen and Rod Copland purchased Paudash Lake Marina in 2009 from Tyleen's parents, Des and Laraine Noblett, they reassured everyone on the Lake that the treasured Marina would remain an important feature of the narrows. Before buying the Marina, Rod was a mechanic at Chandos Lakeview Cottages & Marina. Tyleen was formerly a receptionist at a large Mississauga company while returning to Bancroft to work at the Marina on weekends. She later moved back home to work at the Bancroft Medical Clinic, which is now the Bancroft Family Health Team. When Des, Tyleen's father, suffered a heart attack in 2008 it was decided he needed to step back from full-time management. And that's how the Coplands and, now, their dogs - three gorgeous Great Danes named Hunter, Toby and Monty - set up shop at Paudash Lake Marina. The summer of 2015 will be their seventh summer on the Lake and they love every minute of it. 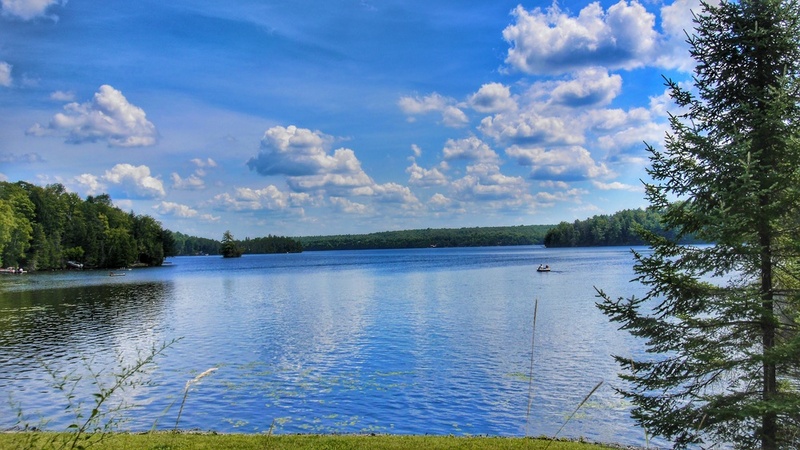 Tyleen's favourite part of each summer is seeing families and cottagers return year after year. She loves catching up with their winter stories. Even more, she loves being part of their summer lives as she has been since she was 12 years old helping her parents run the Marina. Tyleen and Rod love Paudash Lake because it is a wide open body that isn't too large and has few hazards. They love that you can get around the Lake in under one day. The cottagers and customers are pretty great too! 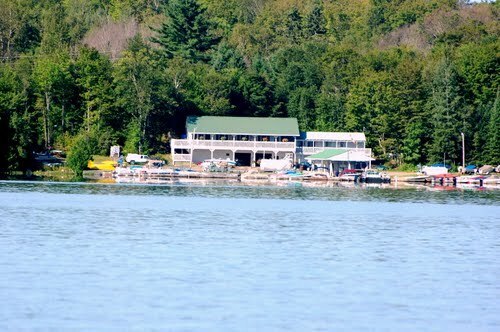 The Marina's amenities are many: boat rentals, barge rentals, dockage, boat launching, premium grade gasoline and propane, boat repairs, service, winterizing, storage, plumbing and hardware supplies. And, of course, there is the Paudash Lake Marina General Store featuring Kawartha Dairy Ice Cream and every other summer cottage essential. Travellers from as far as The Netherlands, Ireland, Germany and Switzerland come to Paudash, along with many Ontarians. The Marina also hosts a number of visitors who arrive by plane from Kasshabog Lake, Orillia, Sudbury, the Ottawa Valley and more. The Marina ensures they always have aviation fuel for such fliers. Last year, the Marina hosted Sky-Mazing Parasail Adventures which will be returning on Saturday, July 4, 2015. The Marina will also host the Don Thomas Rock Bass Memorial Fishing Derby on July 11, 2015. The Paudash Volunteer Fire Department will host an onsite BBQ selling hamburgers and hotdogs with all proceeds going to the Fire Department. For more information on area fishing derbies, visit the Bancroft Bass Tournament Series. Also on the Lake this summer is the free family fishing week from July 4-12 where families can fish without a permit. And on July 1, the Paudash Lake Boat Parade will leave from North Bay Beach and end at The Lakehouse Restaurant for refreshments. The boat parade is organized in part by one of the Marina's dockers. This summer, Tyleen and Rod will be giving the exterior of the Marina facelift with a fresh coat of paint. As always, they are supportive of other businesses on the Lake, and those throughout Bancroft and Apsley. 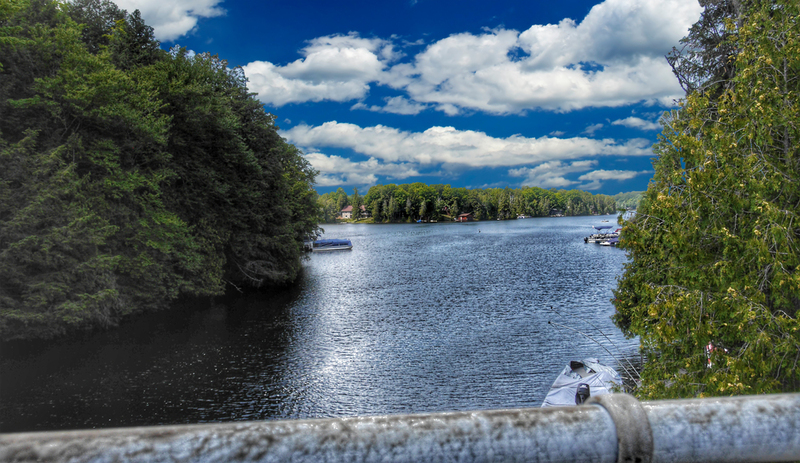 The Marinas all try to work together to get cottagers, vacationers and locals in need of finding parts, service and repairs back out on water quickly so they can continue to enjoy summer fun on the lakes. If you're in the area this summer, please stop in and say hello to Tyleen, Rod, Laraine and Des at 1320 Macgillivray Road, Bancroft. Monty, Toby and Hunter will meet you in the driveway for a proper Paudash Lake welcome.